Public transportation in Sitka is unique. 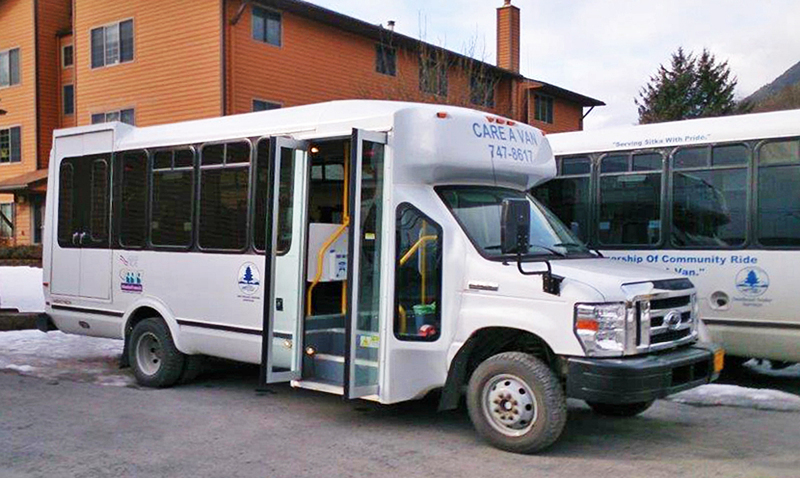 Instead of being operated by a city or county, the nonprofit Center for Community oversees Sitka’s transportation program, with help from two main partners — Sitka Tribe of Alaska operates the RIDE (the blue bus fixed-route scheduled service) and Southeast Senior Services operates the Care-A-Van (the white paratransit buses for seniors and those needing assistance). Many businesses in Sitka contribute to public transit by donation of bus stop spaces and bus parking space in their private parking lots. Local radio and television stations donate prime-time advertising of public transit services. 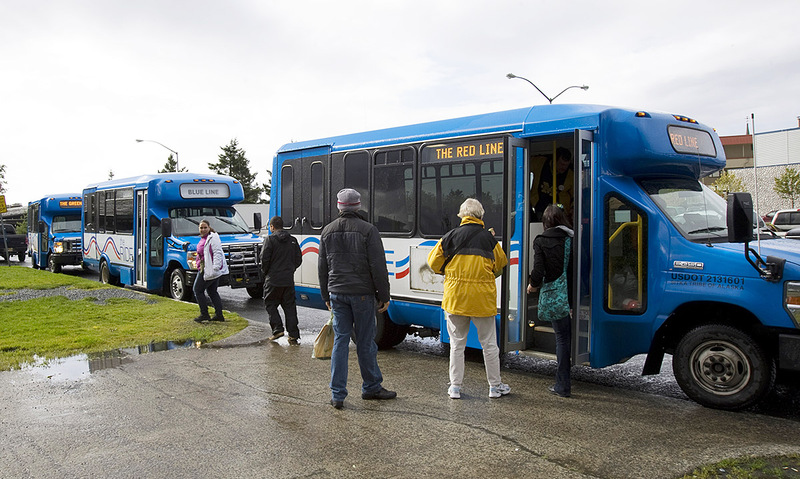 Sitka Tribe of Alaska, since late 2007, has combined its own federal Tribal Transit grant with the grants obtained by Center for Community, in order to “enhance and expand” the RIDE’s services for the entire community. Without the Tribal Transit grant, the RIDE would return to its status in 2002-2007, where there were only two routes, not three, and the blue buses did not offer services to as much of the geographic area of our community as they do today. In addition, Sitka Tribe of Alaska donates annually at least $35,000 from other tribal funds, in order to support the RIDE. The tribe passes through to Southeast Senior Services federal grants made to the tribe for nutrition and transportation services to elders, which funds allow expanded hours and days of operation of the Care-A-Van for all seniors and persons with disabilities in the Sitka community. Southeast Senior Services, in addition to its contract from Center for Community to serve persons younger than age 60 who need Care-A-Van services, also combines in the overall transit system its own grants from the State for senor transportation, as well as other funds raised by the agency and by the local Swan Lake Senior Center. The City and Borough of Sitka, because it is the owner of the Swan Lake Senior Center facility, has always supported the Care-A-Van services by providing fuel and maintenance for the white Care-A-Van buses, and has maintained that support even as the role of Care-A-Van expanded to include serving persons younger than age 60 and expanded to evening and weekend hours. This contribution of fuel and maintenance amounts to about $36,000 per year. The city also donates for the RIDE blue buses free bus stop spaces in city-owned parking lots. For the first time, in 2014 and again in 2015, the city voted to contribute $25,000 of general city revenue toward support of the RIDE public transit system.